Ok, you might have seen the numbers already. You've heard that this Grand Prix had 1,836 players, which by a far margin made it Poland's largest Magic tournament ever. But what does that actually mean? How big is an event that fills the hall with both the main event and numerous side events? Well, since the previous largest event was last GP Warsaw, with about 1,200 players, that is what the tournament was expecting this time as well. But when almost 2,000 enter the main event, and an additional 500 show up to play side events, the tournament halls were packed. I mean literally packed with people. There were so many players in the hall that the judges had to seize the feature match area. They needed “every chair possible” for the main event. Side events even had to put a cap on how many could enter, since there were plenty of Magic hungry players who wanted to participate in Chaos drafts, Legacy events, Standard tournaments and everything else this weekend had to offer. People were playing Magic everywhere. I saw people testing their sealed deck builds sitting on the floor playing out their games. It was great. The atmosphere just couldn't breath more Magic than it did on Friday morning. And the staff in charge of logistics did an excellent job. People were just eating, living and breathing Magic all weekend. And one of the loudest cheers on Friday was when there was an announcement about an additional MagicFest in Poland next year - in Krakow. And who knows, maybe the record for Poland's largest Magic tournament only lasts until then. The never ending discussion about which guild is the strongest continues. 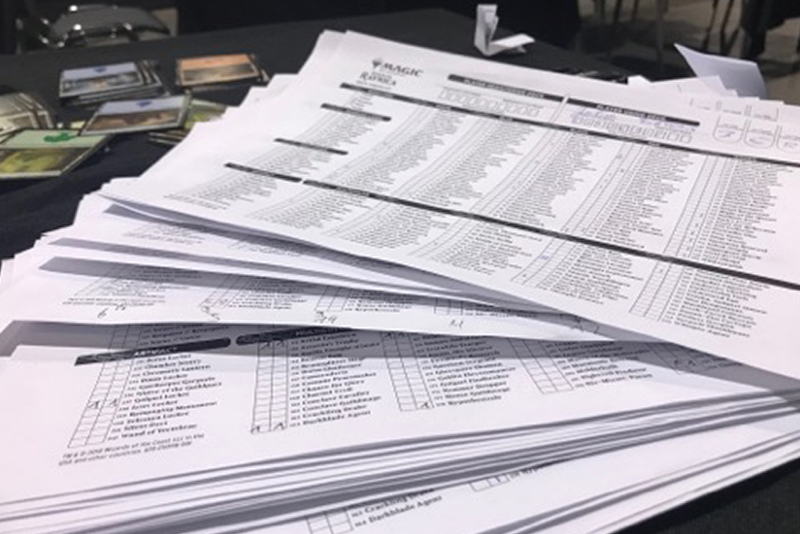 The big story at Pro Tour Guilds of Ravnica was that the format seemed to have turned into a Boros guild meeting when over 30 percent of the 3-0 decklists in the first draft turned out to be Boros drafters. The Boros reign continued at Grand Prix Melbourne, where all three of the undefeated players in the sealed deck portion had opened insane Boros decks. All of them featuring Aurelia, Exemplar of Justice. The drafts from Australia sadly only made up for a small sample size, so it was hard to draw any conclusion from it. In the end though, Taiga Tsjujikawa took the trophy with a Boros deck, featuring four copies of Hammer Dropper. Hammers were dropped in Warsaw as well, but among the undefeated sealed decks lists, it was only Taylor Dix who represented the Boros guild. He did so in style though, with a mandatory copy of Aurelia, Exemplar of Justice, that seems to be the key to an undefeated record on Day One. When the numbers were in after the first draft I took a look at the 3-0 decklists from 29 of the pods. That is all players who started the day at 7-2 or better. Quite the chaotic pile to sort through. Decklists, decklists everywhere, and all the sideboards did shrink. As it turned out - quite the spread, and it seemed like Golgari did best. And among them there was one player, who had a deck that certainly stood out, Eduardo Sajgalik. Put yourself in the following scenario: You have managed to go undefeated on Day One at a Grand Prix, and you've just drafted one of the most insane Boros deck you have ever seen in Guilds of Ravnica. You win your first two rounds quite easily and find yourself at 11-0, with half a foot into the Top 8 already. The only thing between you and being the only undefeated player at 12-0? Pascal Vieren with a Dimir deck that looks more like a preconstructed deck than a draft deck. This is where Julien Berteaux found himself at lunchtime in Warsaw. His Boros deck was in fact so good that a 2-1 result with it would be a bit of a dissapointment. It featured three copies of Skyknight Legionnaire, three Direct Current and a Tajic, Legion's Edge among other goodies. Pascal Vieren Dimir deck was looking strong as well, with three copies of Darkblade Agent, a bunch of Surveil cards and both Doom Whisperer and Lazav, the Multifarious. So the feeling of the pod final of the highest seeded pod had the feeling of more than just another swiss round. The winner would also be almost guaranteed to make the Top 8, as a 12-2-1 record usually get there. Only two undefeated remained after round 11 as they played out the final of their pod. Sadly the match didn't offer as much excitement as the hype building up to it. As Berteaux swept Vieren 2-0 with strong starts like Goblin Banneret into Boros Challenger and Skyknight Legionnaire in Game One and Tenth District Guard into Tajic, Legion's Edge in Game Two. Vieren fell behind fast in both games and his deck only seemed to deliver five mana removal spells against Berteaux's lightning fast hands. Boros once again proving how to get the job done. At least when you're the only one at the table drafting it. “I first picked Tajic, Legion's Edge in my first pack, but wasn't sure that I was in Boros until pick four or five. But when a Skyknight Legionnaire came pretty late I knew that it was open, and after the draft it felt like I was the only one drafting Boros. So the deck really felt like 3-0, but I knew that Vieren had a good deck too since I passed him the Doom Whisperer in the third pack”, the Boros master Berteaux concluded. Julien Berteaux was more relieved than shocked that his Boros deck delivered a 3-0 record. There might be an almost infinite number of Grand Prix winner in the history of Magic. And almost as many Pro Tour Winner. Well, maybe not as many, but there still are plenty, and you will run into quite a few of them at any given Grand Prix. What there aren't that many of however, are world champions. You know - actual world champions, from before the days of Players Championships, World Magic Cup and all the tournaments that somehow have replaced the classic event simply called the World Championship. Personally I have never won the World Championship. Sure, I was third back in 1996, but who's counting? Someone who has actually won a World Championship and was a player that I was both surprised to see here in Warsaw, and even more surprised to see do well was 2004 world champion Julien Nuijten. 2004 World Champion Julien Nuijten had quite a deep run in Warsaw. Someone mentioned his name during on Day One, but it wasn't until the middle of Day Two that someone tipped me off that he was doing well. “Did you see that Julien is 9-1”, fellow Dutchmen Jan van der Vegt told me between rounds. And it didn't stop there. He won to be 10-1, 11-1, and when I finally put him in the feature match area he won again and found himself at 12-1. Did it stop there? Nope, he beat Julien Berteaux in round 14 and was suddenly 13-1, which looked to be a lock for Top 8. He even played it out in the last round, and also won, rounding up the swiss with a 14-1 record and in first place. Not bad for someone who hasn't played a Grand Prix in five years, and mostly cubes with friends for fun. “I did start playing again and testing online with this set though”, he explained. “A friend told me that the new set was really good, so I took his word for it and started playing again. But the plan this weekend was really just to have a weekend with 8-9 guys in Warsaw. We rented a house and decided to play some cards while we were here." His run ended in the quarter-final against Pascal Vieren, but it was a delight to see the Dutchman in action, and reminiscing back memories of his victory at the World Championships at the age of 15 all those years ago. After two days, 15 rounds of swiss, three drafts, and endless hours of preparation, Eduardo Sajgalik finally stood as the winner of Grand Prix Warsaw. The win was his first win in a major tournament and he was clearly emotional after finally reaching such an achievement. “I can finally take one of these home," said the happy winner. Eduardo Sajgalik could finally lift a trophy as winner. And it had been a joy following him all weekend. From his latest stories as a community consultant to his insane draft deck in the first draft of the day. Grand Prix Warsaw couldn't have a more deserving winner. And for the champ - exciting times await, as he is flying straight to Japan for the Legacy Grand Prix next weekend and then to Liverpool for Modern team trios there. Make sure to keep an eye on coverage the upcoming weekends to see how he fares there!